Leading Manufacturer of horizontal fire tube boiler, automatic fire tube boiler, industrial fire tube boiler and fire tube boilers from Ahmedabad. We are suppliers of Horizontal Fire Tube Boiler, it is a traditional three-pass, wet-back horizontal fire tube boiler. The first pass flows through the furnace from front to back. The furnace is corrugated to maximize efficiency while also minimizing thermal stress. We are suppliers of Automatic Fire Tube Boiler, it is a traditional three-pass, wet-back horizontal fire tube boiler. The first pass flows through the furnace from front to back. The furnace is corrugated to maximize efficiency while also minimizing thermal stress. 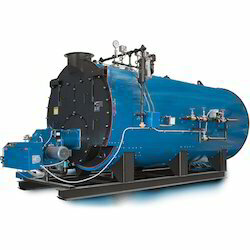 We are suppliers of Industrial Fire Tube Boiler, it is a traditional three-pass, wet-back horizontal fire tube boiler. The first pass flows through the furnace from front to back. The furnace is corrugated to maximize efficiency while also minimizing thermal stress. 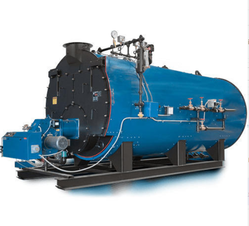 We are suppliers of Fire tube Boiler, it is a traditional three-pass, wet-back horizontal fire tube boiler. The first pass flows through the furnace from front to back. The furnace is corrugated to maximize efficiency while also minimizing thermal stress.